On Saturday night, our local symphony orchestra presented their annual tribute to the Oscars concert, featuring music from Academy Award winning films, which got me thinking about the role music plays in our enjoyment, understanding, and memories of films. I realized as I listened that some music has become a part of our collective consciousness (to a greater or lesser extent). I haven’t seen any of the Bond films, either, yet I knew nearly all the music in the 007 segment — and I learned that a song I like very much, Nobody Does it Better, had it’s beginning in a Bond film. Maestro Sawa is the quintessential movie buff, so he introduces each segment with stories of the movies themselves, of the score, of the stars and the composers. It is fascinating — and he obviously enjoys the concert as much as the audience does. The highlight of the evening for me was the tribute to Henry Mancini. I had a smile on my face (quite likely a rather goofy smile) throughout the medley, which could almost have been dubbed a tribute to Blake Edwards as well, since only a few of the songs excerpted in the medley were from films other than one of Blake’s. 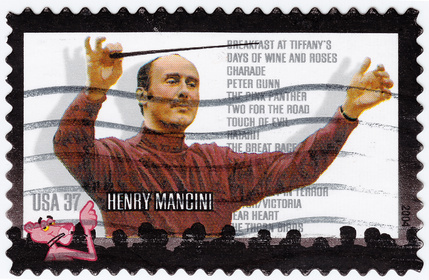 Mancini was a master of melody and of evoking a mood, from The Days of Wine and Roses to the theme from Peter Gunn and the instantly recognizable theme from The Pink Panther series. Click on the link in the first mention of Mancini’s name in this paragraph, go to His Music, then to Music Samples, to hear clips of these songs and so many more. Music adds so much to a film. I don’t mean the songs sung in musicals, but the underlying score. The music that intensifies the emotion, the reaction of the audience to what the characters are experiencing. The music that may be thought of as “incidental” but with a purpose that is far from incidental. The overall tone of the film? Note: Mayrand’s blog is now part of his website. Unlike writing the score for a musical, in which the songs are written long before rehearsals begin, in a collaborative effort between the book writer, the composer, and the lyricist, a film score, the underlying music that helps drive the scene forward, is composed as one of the last steps in producing the movie, after the action is captured on film. Either with the film playing before the composer’s eyes, or with a minute-by-minute, second-by-second written description of the action, the composer creates the score, building up the action, getting the viewer deeper into the character’s reaction, working synergistically with the script and the action on the screen to form the total experience that is the film. You can get an idea of how this happens in the 2006 movie The Holiday in which Jack Black’s character is a film composer. Randy Newman explains the process far better than I could, in this video. Next time you watch a movie, pay attention to the music. How does it affect your emotions from scene to scene? What does it tell you that may not be obvious on the screen? You might be surprised. Oh — that favorite bit of underscoring that I mentioned at the beginning of the post? It is by Henry Mancini, in his score for the film Victor/Victoria. There is a scene (if you have the DVD, it is scene 19, King pays a call) in which there is an intricate “dance” of people sneaking into places they don’t belong, hiding, changing places, with an underscore titled Cat and Mouse. Watch it, and see what Mancini does with the music. It is, in my mind, perfect. And now I think I’ll watch a movie… no, I think I’ll listen to a movie. Fun post, Beth!! I love Victor Victoria. I’ll have to pay close attention to the scene you mentioned and the music. I watched Rebecca on TCM the other night. The score to that movie, boy oh boy! Talk about luring you to the edge of your seat. A facebook friend posted this question: If your life was a movie, what song would be in the opening credits? My answer was, Did You Ever Have to Make Up Your Mind? and Georgie Girl. Again, really fun post! The tribute to Mancini must have been wonderful. I love his music too. I mentioned a Neruda poem on my FB page yesterday and someone then posted about the moving Italian movie, Il Postino, about Neruda. Some else then mentioned the CD of the film’s music with many of Neruda’s poems being narrated by celebrities. I so want to buy this CD now. Yes, you are allowed to admit you haven’t seen the Lord of the Rings films. 🙂 The film score is fantastic! There are some film scores that I have bought because I like the composer, and to this day I still haven’t seen the films. And for some films, the score doesn’t work quite so well. The weakest part of Ladyhawke, for example, is the cheesy 80s music in the soundtrack. It would have done much better with a classical score. In my opinion, of course! Wonderful to see you here, Emily! Thanks so much! Good to point out that there are scores that fall short, as well. Thank you for that. Some scores seem to go the path of least resistance, or just put in stock music instead of hiring a composer to fully flesh out the film, and that shows. Be prepared to grip the sides of your seat when watching or `listening` to Lord of the Rings. I did! I know what you mean about the part you mention in Victor Victoria. Great movie, and Mancini can do no wrong with music! Well, to tell the truth, I’m not likely to watch LOTR (shh! don’t tell Brian or Emily!) so I won’t have to worry. 😉 Mancini was certainly one of the best. Lovely post Beth. I am a big fan of Mancini’s work. I would have loved to have heard the tribute! I know the scene you are talking about, saw it on stage and on film, but I don’t remember the music in that scene. I normally pay attention to how music is used in films — Harry Potter is another good example. I can identify the action with certain themes and know what happening. And, I tried watching the Lord of the Rings, and got bored. Not the kind of movie I like to watch. Thanks, Pat. So many songs that have become pretty much iconic in our society turn out to have been written by Mancini. What a talent! Love what you say about identifying the action in Harry Potter with themes in the music. Good ear! I always pay attention to the musical scores for movies and marvel at how music completely transforms a scene, and sets the mood. We were watching some extra features on some dvd (can’t even remember what the show or movie was) but they play some scenes with and without music and wow, is music ever important! Fun post…thank you! Oh, it would be fascinating to see/hear a movie’s scenes with and without the music. That would really get the point across! Thanks, Teresa!